Vittorio Arrigoni (Italian pronunciation: [vitˌtɔːrjo arriˈɡoːni] ; 4 February 1975 – 15 April 2011) was an Italian reporter, writer, pacifist and activist. Arrigoni worked with the pro-Palestinian International Solidarity Movement (ISM) in the Gaza Strip, from 2008 until his death. Arrigoni maintained a website, Guerrilla Radio, and published a book of his experiences in Gaza during the 2008–09 Gaza War between Hamas and Israel. Arrigoni was the first foreigner kidnapped in Gaza since BBC journalist Alan Johnston's abduction in 2007. He was subsequently killed. His murder was condemned by various Palestinian groups. Besana in Brianza is a town and comune in the province of Monza and Brianza, Lombardy, northern Italy. It received the honorary title of city with a presidential decree of 16 February 1971. Monza is a city and comune on the River Lambro, a tributary of the Po in the Lombardy region of Italy, about 15 kilometres north-northeast of Milan. It is the capital of the Province of Monza and Brianza. Monza is best known for its Grand Prix motor racing circuit, the Autodromo Nazionale Monza, which hosts the Formula One Italian Grand Prix with a massive Italian support tifosi for the Ferrari team. Palestinian territories has been used for many years to describe the territories occupied by Israel since 1967, namely the West Bank and the Gaza Strip. More recently, the official United Nations terminology has been used, occupied Palestinian territory increasingly replacing other terms since 1999. The European Union also has adopted this usage The International Court of Justice refers to the West Bank, including East Jerusalem, as "the Occupied Palestinian Territory" and this term is used as the legal definition by the International Court of Justice in the ruling in July 2004. The term occupied Palestinian territories is also still in common use. il manifesto is an Italian language daily newspaper published in Rome, Italy. While it calls itself communist, it is not connected to any political party. Ilan Pappé is an expatriate Israeli historian and socialist activist. He is a professor with the College of Social Sciences and International Studies at the University of Exeter in the United Kingdom, director of the university's European Centre for Palestine Studies, and co-director of the Exeter Centre for Ethno-Political Studies. "Zionism is an abominable, racist and colonial movement. Like all colonial and apartheid systems, it's in the interest of all that it be swept away. My hope is to see it replaced, without any bloodshed, with a democratic, secular and lay state – for example on the borders of historic Palestine – and where Palestinians and Israelis could live under equal rights of citizenship without ethnic and religious discrimination. It's a wish that I hope will soon become a reality." Various condemnations of Arrigoni's killing were released by other Palestinian factions with Fatah decrying it as an "act of betrayal," the Popular Resistance Committees calling it "cowardly," Islamic Jihad calling it a "grotesque crime," and Mustafa Barghouti saying it was a "shocking criminal act." A spokesman for Palestinian president Mahmoud Abbas condemned it as an "act of treason". Salahif ul-Ninja, a leftist Palestinian faction, went as far as to describe it as a "national tragedy". Mohammad Yusuf Dahlan born on September 29, 1961 in Khan Yunis Refugee Camp, Khan Yunis, Gaza Strip also known by the kunya or nom de guerreAbu Fadi is a Palestinian politician, the former leader of Fatah in Gaza. Dahlan was born to a refugee family from Hamama, the youngest of six children. Gilad Shalit is a former MIA soldier of the Israel Defense Forces (IDF) who on 25 June 2006, was captured by Hamas militants in a cross-border raid via underground tunnels near the Israeli border. Hamas held him captive for over five years, until his release on 18 October 2011 as part of a prisoner exchange deal. Events in the year 2007 in Israel. The Teacher's Bookshop was a Christian bookstore in the Gaza Strip that was in operation between 1998 and 2007. Located in the centre of Gaza City, it was Gaza's only Christian bookshop, catering to the needs of Gaza's tiny Christian minority. In addition to selling books, the store also ran educational services and an internet café. Events in the year 2010 in the Palestinian territories. Events in the year 2006 in the Palestinian territories. The August 2010 West Bank shooting attack was an attack near the Israeli settlement of Kiryat Arba in the occupied West bank, carried out by Hamas militants. Four Israeli settlers were killed after gunmen attacked their vehicle. The four victims, including a pregnant woman, were civilians from the West Bank settlements of Beit Hagai and Efrat. It was the deadliest Palestinian attack on Israelis in over two years. Events in the year 2011 in the Palestinian territories. Dirar Abu Seesi or Abu Sisi was a deputy engineer for the Gaza Strip's sole electrical plant, which provides 25% of Gaza's power. Israel alleged that he is a Hamas weapons engineer. In February 2011, he traveled to Ukraine, his wife's native country, to apply for citizenship, after coming to believe that Gaza was no longer a safe place to raise his six children. He disappeared in Poltava on February 19, and later turned up in an Israeli prison after being kidnapped by Israeli intelligence personnel. On April 4, 2011 he was indicted for his aid to Hamas and was convicted on March 30, 2015 in a plea bargain. 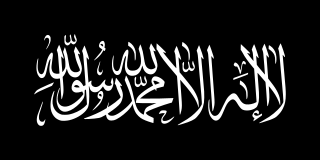 Jahafil Al-Tawhid Wal-Jihad fi Filastin is a Sunni Islamist Palestinian group in the Gaza Strip and the Sinai peninsula, and is the branch of al-Qaeda in Gaza. The establishment of the group was publicly announced on 6 November 2008, with communiqués vowing loyalty to al-Qaeda, after having "received the messages of Osama bin Laden and Ayman Al-Zawahiri." Various forms of the "Tawhid al-Jihad" label have appeared in relation to developments in the Gaza Strip. The size of the group is not publicly known. Raed al Atar (1974–2014) was the commander of the Rafah company of the Hamas Izz ad-Din al-Qassam Brigades and member of the Hamas high military council. According to the Congressional Research Service analyst Jim Zanotti, his command was important due to Rafah being the destination point for the smuggling tunnels from Egypt. The 2006 Gaza cross-border raid was a cross-border raid which was carried out on 25 June 2006 in which a Palestinian militant squad thought to consist of 7 to 8 militants managed to cross the border through an underground attack tunnel near the Kerem Shalom Crossing and attack Israel Defense Forces (IDF) military positions. In the attack, two IDF soldiers and two Palestinian militants were killed, four IDF soldiers were wounded, and one wounded soldier Gilad Shalit was captured and taken to the Gaza Strip. The murders of Avi Sasportas and Ilan Saadon refers to two separate abductions undertaken by Hamas which took place respectively on February 16 and May 3, 1989 and the subsequent murders of the two men. The two Israeli soldiers were Avi Sasportas and Ilan Saadon. The Kidnapping and murder of Nissim Toledano began on 13 December 1992, when a squad of Hamas kidnapped Israeli border policeman Senior Sergeant Nissim Toledano in Lod. Although the captors demanded the release of Hamas leader Sheikh Ahmed Yassin for Toledano, Toledano was murdered by his captors. Hisham Al Saedni, also known by the nom de guerre Abu Walid al-Maqdisi, was a Palestinian military activist and a Muslim leader and founding member of the Mujahideen Shura Council in the Environs of Jerusalem in the Gaza Strip and he was also leader of al-Tawhid wa al-Jihad, a branch of al-Qaeda in Gaza. On 12 June 2014, three Israeli teenagers were kidnapped at the bus/hitchhiking stop at the Israeli settlement of Alon Shvut in Gush Etzion, in the West Bank, as they were hitchhiking to their homes. The three teens were Naftali Frenkel, Gilad Shaer, and Eyal Yifrah. ↑ Johnston, Nicole. Vittorio Arrigoni: The man I knew. Al Jazeera . 15 April 2011. 1 2 3 4 5 6 7 Hooper, John. Vittorio Arrigoni: pacifist supporter of the Palestinian cause. The Guardian 15 April 2011. 1 2 "Gaza Vittorio Arrigoni murder: Four Palestinians jailed". BBC. 17 September 2012. Retrieved 24 October 2012. 1 2 3 4 5 6 7 Kalman, Matthew.Idealistic blogger 'was more Palestinian than the criminals who killed him'. The Independent . 16 April 2011. ↑ Mackenzie, James. "Dismay and sorrow" in hometown of Italian activist. Reuters . 15 April 2011. ↑ Saber, Mohammed (15 April 2011). "Gaza Killing of Italian Activist Deals a Blow to Hamas". The New York Times . Gaza. European Pressphoto Agency . Retrieved 6 July 2011. 1 2 3 New video released of slain Italian activist: 'Day I arrived in Gaza was happiest of my life'. Haaretz . 15 April 2011. ↑ Gaza, Stay Human. Amazon Book Review. ↑ "guerrilla radio > Gli industriali dell'olocausto". guerrillaradio.iobloggo.com. 1 2 Daily Mail Reporter, Bloodied, bound and paraded on YouTube... then hanged hours later: Horrific fate of peace activist kidnapped in Gaza. Daily Mail . 15 April 2011. ↑ Gaza, eliminate il pacifista Arrigoni (Gaza, eliminate the pacifist Arrigoni), Peacereporter , 14 January 2009. 1 2 Salafi leader: Islam prohibits murder. Ma'an News Agency . 15 April 2011. ↑ Italian Activist Found Dead in Gaza after Abduction. BBC . 15 April 2011. ↑ Body of kidnapped Italian peace activist Vittorio Arrigoni found in Gaza. The Guardian . 15 April 2011. ↑ Urquhart, Conal. Palestinians rally to mourn kidnapped Italian activist murdered by extremists. The Guardian . 15 April 2011. 1 2 3 4 Body of abducted Italian activist found in Gaza City. Ma'an News Agency . 15 April 2011. ↑ Fares Akram and Isabel Kershner. Gaza Killing of Italian Activist Deals a Blow to Hamas. New York Times . 15 April 2011. 1 2 Vittorio Arrigoni killing: Suspects die in Gaza siege. BBC . 19 April 2011. 1 2 Associated Press.Gaza police close in on suspects in Vittorio Arrigoni murder. The Guardian . 19 April 2011. ↑ Issacharoff, Avi. Hamas kills 2 suspects during manhunt for murderers of Italian activist in Gaza. Haaretz . 20 April 2011. ↑ "Trial Over Murder of pro-Palestinian Activist Begins in Gaza". 9 September 2011 – via Haaretz. ↑ "Gaza court cuts sentence in Italian murder". Al Jazeera. 19 February 2013. Retrieved 2 August 2015. ↑ Associated Press,'Hamas court convicts 4 in Italian activist death,' at Ynet, 17 September 2012. ↑ Fares Akram, 'Gaza: Hamas Court Convicts 4 in Murder of Activist,', at New York Times, 17 September 2012. ↑ 'Gaza court cuts sentence in Italian murder case' Press Trust of India. Published: 19 February 2013. Accessed: 20 February 2013. ↑ Diaa Hadid, Majd Al Waheidi, 'ISIS Allies Target Hamas and Energize Gaza Extremists,' New York Times 30 June 2015. ↑ 'Gazan who murdered an Italian peace activist dies fighting for IS', at The Times of Israel, 28 November 2015. 1 2 Candlelight vigil held for Italian activist. Al-Jazeera . 16 April 2011. 1 2 Egypt offers to help slain activist's family enter Gaza. Ma'an News Agency . 16 April 2011. 1 2 3 4 5 Abbas: Murder of Italian activist is treason. Ma'an News Agency . 16 April 2011. 1 2 Kalman, Matthew. Activist's murder shakes Hamas's grip on Gaza. The Independent . 16 April 2011. 1 2 Aldabba, Ahmed. "Archived copy". Archived from the original on 18 April 2011. Retrieved 30 April 2011. CS1 maint: Archived copy as title (link) , Los Angeles Times . 16 April 2011. ↑ Associated Press and Haaretz Service. Hamas official hints Israel killed Italian activist to intimidate future Gaza flotilla members. Haaretz . 15 April 2011. ↑ Weinthal, Benjamin. 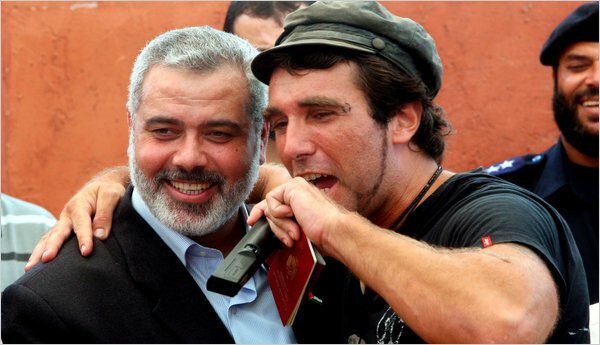 "Italian politician: Vittorio Arrigoni was ‘enemy of Jews’." The Jerusalem Post . 26 April 2003. Retrieved on 11 August 2011. ↑ Quinton, Pennie, Vale Vittorio Arrigoni, 'hero of Palestine'. The Guardian . 16 April 2011. ↑ Ajl, Max. "in memoriam: Vik Arrigoni" . Retrieved 19 June 2011. Staying Human , a documentary film on Arrigoni.